UQ Runner-up and People’s Choice winner, Ryan Stafford from the School of Health and Rehabilitation Sciences, is conducting research into pelvic floor muscle function which aims to improve treatment options for urinary incontinence in men who have undergone surgery for prostate cancer. “Prostate cancer is the most common form of cancer in Australian men and it is predicted that one in four men will develop it in their lifetime. “While survival rates are increasing, up to 30% of men who undergo surgery will suffer urinary incontinence afterwards. I believe my research may contribute to a new level of treatment and positively impact many men’s lives,” Mr Stafford said. Originally a hesitant presenter, Ryan was encouraged to participate by friends as a way to confront his fear of public speaking and improve his presentation skills. “I knew participating in the 3MT would force me to express my research ideas in a clear and concise way which everyone could understand. 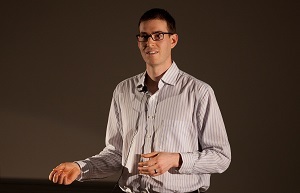 “I would strongly encourage other research students to participate in 3MT. If early career researchers do not possess the skills to present their research in a clear and engaging way, our message, and the implications of our research, could be lost,” Mr Stafford said.